Will 6X3.25 Magnets Ever Help in Retargeting Your Campaigns? Pricing is one of the major reasons for deflection. Today, with a bad economy, people are always searching for best buy pricing benefits. They would be happier to receive a higher discount on the item, which they wish to buy. You can easily offer them a large discount by sending a discount coupon, which nurses their purse strings and make them believe in your brand. Sometimes images may betray. People may leave your website thinking that you are selling all low value and low quality items. You can easily correct them by sending customized 6×3.25 magnets offered in stock sizes – 20 MIL or 30 MIL. High quality promotional gift is always a faith restorer and people would start believing in your business more than before. Building impressions about the quality is one of the major ideas behind promotional gifting. 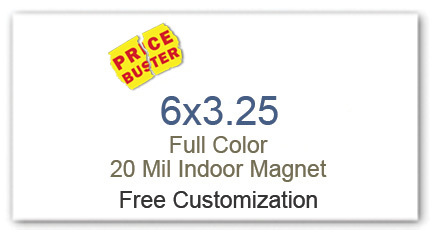 Use personalized 6×3.25 magnets for saying something special such as information about the new breed of items in your brand or new service or achievement or sales information, etc. Prospective customers may have second thoughts about purchasing from you, when you inundate them with some special information. People would be happier to listen to you and would consider association seriously. The decision about information over these customized magnets is entirely yours, but stay assured that it is one, which customers find interesting. Perhaps many of the prospective buyers deflected from the website because they thought that your website lacked that spark for keeping them hooked. Perhaps they were right in their decisions, but you have to prove them wrong by sending customized magnets printed with immediate call for action. Tell them to come to your store before the season ends. You can send customized magnets with immediate call for action to the homes of all your customers, who attended your tradeshow booth or deflected from your website. You can target such customers with their provided addresses at the time of registration or others. This is not an easy task, but not a difficult one either. You can easily build brand advocates through various means. You can send a thanking magnet to say “Thanks for visiting us at www.xxxyyy.com or so. People would think when you took time to appreciate their presence, perhaps what all you can offer them, when they purchase from you. In this way, your brand advocacy will grow without huge investments. This is one of the sharpest ways of converting a critic into a brand advocate. You can easily use 6×3.25 custom magnets in many other ways for brand and recognition building.